I wanted to share some tips and trials on the subject of scuba diving for lobsters. Based on my 30 years of experience in which I seize in season upon for love of the sea. The hunt, the stories at the Tiki bar, and of course warm garlic butter. You may have heard it said that Lobsters are the “cockroaches of the sea”. I think this is a little unfair, although they are bottom feeders, and some scientists believe they evolved from insects. Maybe that is why you have to purchase a bug stamp along with your fishing license to catch them. Well these tasty little critters, be what they may are low in calories, taste great with a beer after the dive, and far better than most insects ingested on Man vs Wild. Lobster diving is for beginner to experienced divers alike, and a great fun, just as scuba diving is still one of the best recreations for family and friends. A commonly asked question is why are lobsters so expensive, if anyone can harvest them in season? Of course the sweet white lobster meat is a big draw, but the price is pretty tough to chew on. Well, I like history and found this little fact to be interesting. Lobsters were once a throw away food, only eaten by the poor, desired by none. I recommend a short blog by Erica Schecter. Quote ” Formerly regarded as “the cockroach of the sea” and fed to servants, migrants and even people’s cats, lobster was the laughing stock of seafood. So, what changed our attitudes and raised the price of a lobster tail from the cost of a soup bone to a BMW? They were brought inland as the country industrialized, drawn garlic butter, sweet taste of the sea instead of beef, demand, and a change of attitude. Let us move on and talk about how to catch a back stock of lobsters to give away as Christmas. We will focus on the warm water, Spiny lobsters found in Florida and the Caribbean. First of all, know the laws. Speaking for Florida only, the mini season, which is a two-day season opens the last Wednesday and Thursday of July. Proceeding the opening date of August 1 to March 31st. Counties differ in their take limits so always check the Fish and Wildlife Regulations. Before you hit the water, remember your dive flag, license, and bug stamp whether you are scuba diving or snorkeling. Scuba diving requires proper training. Although most of the water is shallow in the Florida Keys, the most popular spot for lobster hunters. There are several fatalities each year which are statistically new divers. Once you are certified to scuba dive, you should take the advanced open water class, get your nitrox certification, it’s not expensive, very good information and useful for dives between 50 to 100 feet. We recommend to take a rescue diver course. Next, gear up. Fortunately, that is the easy part. 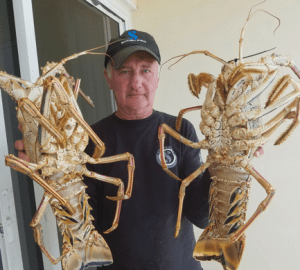 Unlike technical diving which is very equipment extensive and expensive in terms of training and gear, lobster diving should be relaxing and it’s easy to master. Necessary equipment is a small measuring device with which to measure the body, not the tail, known as the carapace. Regulation limit must be over 3 inches measuring between the eyes to end of the shell. A small LED light, very bright and easy carry. Don a good pair of gloves, the Spiny Florida Lobsters are aptly named for the nasty spikes all over their shell. They are not poisonous, but painful. Next, a $5.00 tickle stick and net. Some people prefer a snare, a nifty little tool you can use to loop around the tail, and lock it down. If there’s a catch, (excuse the pun), to what sounds like a sure-fire adventure and dinner on the grill by nightfall, it’s where to find them. Like most of the creatures of the sea, they seek shelter from their predators under rock piles, ledges and debris. If you come across a pile of underwater trash in the middle of a sandy area such as a section of a boat, or any other kind of lone structure tossed in the water by a careless human or one of the frequent tropical storms, stop to look underneath the structure, that is often a gold- mine. It is very rare to see lobsters on wrecks, they get snatched up and eaten by predators like Maine Lobsters in a fish tank. It’s time to make that Giant Stride. Your right hand possesses the tools of a great hunter, a bag and snare,don’t lose them. You will need your left hand to control your buoyancy, and equalize. Looking under ledges or any potential hiding place, think like a lobster and watch for the antenna. Lobsters use them to smell their dinner. Unlike fish that learn to recognize a spear fisherman, you will not scare them by your presence or bubbles. It’s only when you start the process of trying to get the snare behind them that the games begin. You need to finesse it just right or they will retract into the coral ledge. I recommend a thin 3-foot tickle stick to a snare. It allows you to slip behind the bug if they are in a very small space. You simply tap the tail and they come out of their hole to avoid the prodding behind them. An interesting footnote; if the ledge is “loaded” with lobsters, you can bet the small ones will be up front and the larger ones in the back. The king and his little knights. Once the king comes forth, heads up reader, lobsters move backwards and quickly. The strong muscular tail propels them backwards just like a scallop, so get your net behind them quickly, they will swim right into it, slap it to the ground or they will loop and swim right back out. Relax as you carefully remove dinner from the net, holding the tail with a tight grip, lobster tails are much stronger than you think, do NOT hold the carapace, measure it. Observe the underbelly of the lobster and look for eggs. They look like soft orange shag carpet, and you cannot keep females with eggs. It is also against the law to bring in an already “rung” lobster tail. You must bring in the whole crustacean as you would the whole fish. Tip, if you see a Trigger Fish hanging around the top of a reef. Look for a hole, or even under a sponge in the area of the fish, they are looking for the same thing and better at it that we are. To conclude, the lobsters caught by Bill “Bird” Oestreich in the photo were taken from Daytona Beach. Why bother to go to the Keys when you can get bugs as big as your scuba tank? Because you have to have good numbers so they are not picked over, a vessel to take you 25 to 50 miles off shore, the water is 90 – 130 feet deep, usually cold under a thermo-cline, nasty visibility under the thermo-cline, it’s very expensive when all is said and done, and you must stay out of decompression to avoid getting bent and get any bottom time, so your time underwater is limited and early in the season more than half the lobsters have eggs. .